Many people snub their nose at the thought of boiled cabbage, due to the strong odor it produces as it is cooked. However, do not let the odor fool you; cooked cabbage can be a very tasty addition to any meal if prepared properly. With these instructions, you will learn how to cook cabbage perfectly so that everyone will enjoy. The first step in preparing this tasty side dish is to get rid of the odor. If you soak the cabbage in vinegar before preparing, the odor will be drastically reduced. You can also use lemon juice to reduce odor by adding it to the boiling water while cooking. Use both of these options for a mouth-watering dish that everyone will love. Clean your cabbage thoroughly with cold water while removing the outside leaves. Cut the cabbage into four sections and inspect for pests. Soak the cabbage in a sink or large bowl of vinegar water to remove odor and get rid of any dirt or insects. 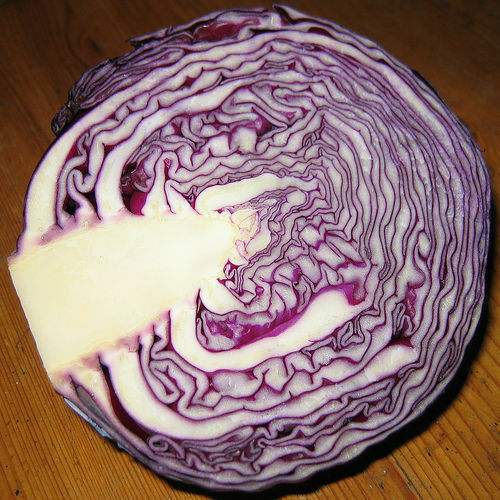 With your knife, cut the stem of the cabbage off of your sections. Then, place the flat side down and cut the cabbage into shreds, choosing your desired thickness. Next, cut your bacon into small pieces as well. You are now ready to cook your cabbage. Now, fill your cooking pot with about an inch and a half of water. Add your cabbage and bacon and bring to a boil. Reduce heat and simmer with the lid off for about an hour until the cabbage is tender. Remember, add a splash of lemon juice to your boiling water to reduce odor while cooking. If you desire, add salt (for taste) to the pan right before the cabbage is finished cooking. This delicious cooked cabbage is perfect when served with a tasty brisket or roast. Cabbage also pairs well with corned beef, hamburger dishes or smoked sausage. Cabbage is also a very healthy addition to any meal due to its cancer fighting abilities and other nutritional benefits. When looking for the perfect side to nearly any meal, consider cooking the perfect cabbage. Don’t waste your vinegar. Just make sure you cook the cabbage for no more than 5 mins. The odour doubles between 5 and 7 minutes of cooking.